Deadline reports that Gunn and Marvel have now confirmed that he will helm production on the third Guardians movie, and that the actual decision made to re-hire Gunn — brought about by Gunn’s apology over his prior tweets and through extensive talks between the director and Walt Disney Studios president Alan Horn — occurred months ago, despite allegations at the time that Disney was still not ready to bring the director back on board. We have confirmed with Disney that the details of Deadline’s report are accurate. Gunn was removed from Guardians of the Galaxy Vol. 3 in July of last year, after right-wing commentators resurfaced years-old crude commentary Gunn had made on social media, targeting the director for his outspoken disapproval of Donald Trump as part of what became a pattern of bad-faith harassment campaigns by internet trolls over the last year. Gunn immediately apologised for the tweets, but at the time, the apology was not enough for Disney. 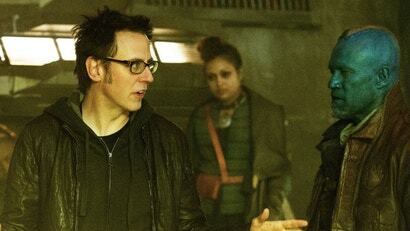 Furore from both fans and members of Guardians cast in the months that followed lead to production on the third movie in the saga — always rumoured to be Gunn’s last with the current iteration of the cosmic superhero team that first ventured out in 2014's surprise smash hit movie — being put on hold, allegedly while a replacement for Gunn was sought out. According to Deadline however, Marvel never actually met with another director for Guardians, despite rumours that Thor: Ragnarok’s Taika Waititi or Ant-Man and the Wasp’s Adam McKay could step in. Although complications arose when Gunn was snapped up by Warner Bros. to write and direct the DC Comics sequel The Suicide Squad last October, Kevin Feige’s team at Marvel Studio and Horn’s at Disney were willing to wait for Gunn to become available again before bringing him back to the fold. Production on Guardians for Gunn will begin after production has concluded on The Suicide Squad, which is currently expected to hit cinemas in August 2021. James Gunn has also weighed in, with his first tweet since 20 July 2018.